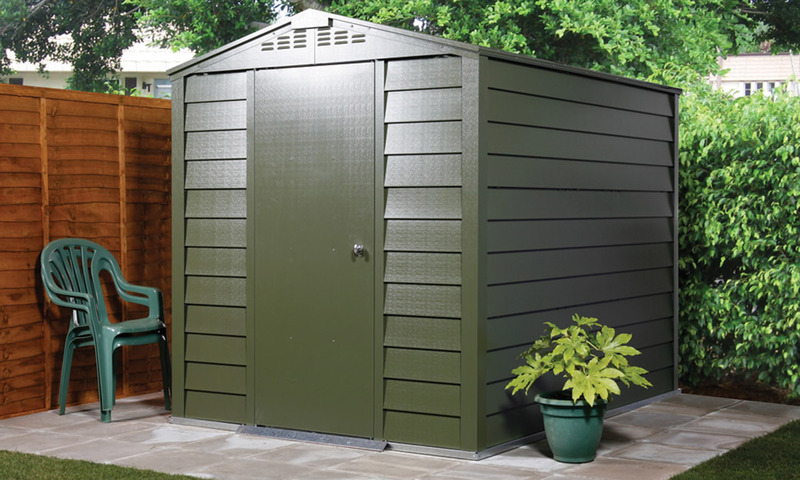 Titan 600 garden sheds are available in four sizes. The traditional apex roof design is ideal for garden and commercial environments. Titan 900 garden sheds have pent style roofs and are available in three sizes. 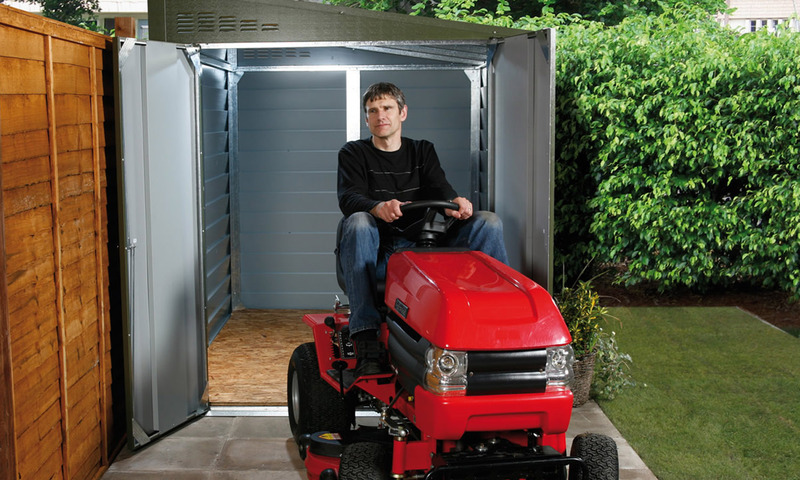 Ideal for storing ride-on lawnmowers and larger garden machinery. 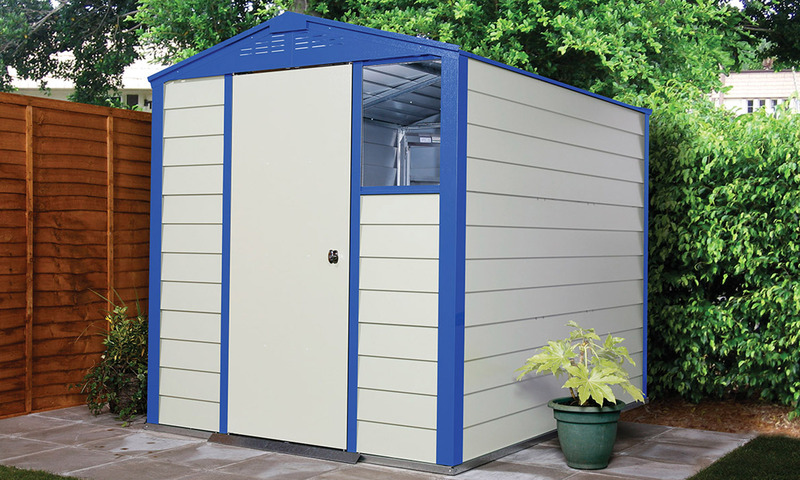 Our new range of coloured sheds are ideal for the modern garden, school, avid football supporter or those who wish to create the popular 'beach hut' look. All coloured sheds have apex roofs. The Titan 108 shed can store a huge amount of equipment. Suitable for even the largest of gardens. It has an apex roof. If you’re after a high-quality metal shed, look no further than Trimetals’ range of strong and expertly designed units. All of our sheds are precision engineered with only the best materials. We use PVC-coated galvanised steel, for example, which is up to 50 per cent thicker than the metal used for most comparable garden sheds. This ensures maximum strength and security, and peace of mind for you. Trimetals’ sheds are easy to construct and even easier to maintain. They’ve been designed in a way that makes them simple and safe to put up, even for those with only basic DIY experience. Precision engineering means that all parts fit together perfectly. 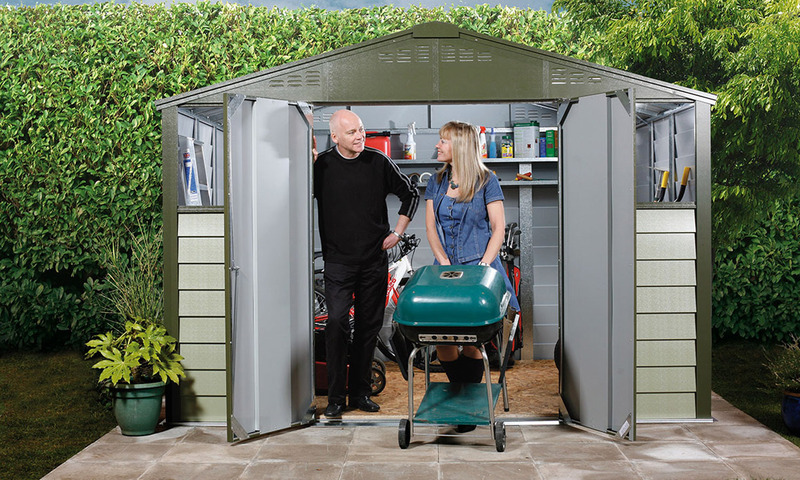 As well as supplying easy-to-understand assembly instructions with all of our metal sheds, we’ve created this handy video to guide you through the process step-by-step. We can even help you decide which basing option to go for, although it’s worth noting that all of our Titan metal garden sheds should be bolted down to a concrete base. Once your shed is up and ready to use, there’s very little maintenance to think about. With a 25-year panel guarantee, and fire-resistant materials, it’ll be standing strong for many seasons to come. The fact that they’re fire-resistant makes Titan sheds great for mobile home sites, and other locations where combustible buildings are unsuitable. 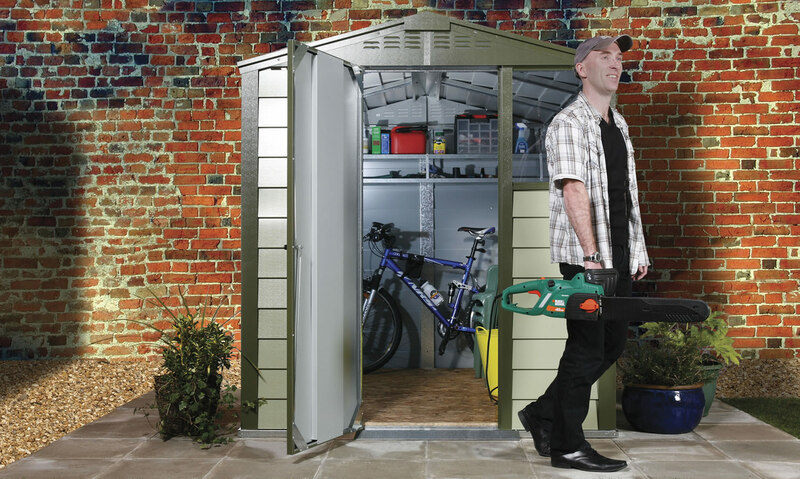 All of our metal garden sheds boast a robust, key-operated locking mechanism, with bolts at the top and bottom of the door making forced entry almost impossible. For that added peace of mind, we have windowless sheds and can even offer a state-of-the-art alarm system – perfect if you’re storing particularly valuable goods. The model of Titan garden shed you go for will depend on your own needs. The popular 108 has two windows and is supplied with wide double doors, making it perfect for storing ride-on lawnmowers and other large garden machinery. If you’d prefer not to have windows, the 900 range offers three sizes, the larger of which is also suited to housing bulkier equipment. Smaller sheds can be found in the 600 range, with the 630, 640, 660 and 680 all coming with one window and a single door as standard. Extra windows and double doors are available as upgrades, however. We offer a wide range of accessories for all of our sheds, to help you get the most out of your investment. This includes wooden flooring, shelves, benches and infra-red alarm systems for maximum security. Explore our range above or get in touch for more information.